A bespoke B2C (Business–to–Consumer) storefront gives you the opportunity to trade your printing services online at any given time of day. SEO capabilities, integrated shipping rates, and instant pricing calculators are all in harness to provide you with a fully functioning and highly professional looking storefront. Quoting print products can be a task to beat! With SoftwareDefinedPrint, you can simply create flexible and effective catalogues covering virtually all print products including quick print, large format, offset, promotional goods, and even static items. Upload your own designs: This workflow allows customers to upload their own artwork if they have already got preselect designs. Start from a blank canvas: Customers can design their own templates, to their own taste, right from the beginning, upload images/backgrounds, and add text/QR codes. Since they are designing it themselves, they can be as creative as they wish! Customize free templates: Customers can also choose from the hundreds of pre-designed templates offered by the SoftwareDefinedPrint web-to-print solution across different categories and tailor it to their tastes. Let us design for you: This workflow is ideally suited to those who love and seek human touch. As well as designing your customers’ artworks up to scratch, the entire artwork approval process from printer uploading files for customer reviews, through customer comments, and down to approvals, are all handled by SoftwareDefinedPrint system. Static Item: This workflow is specially designed for selling non-print specific items. SoftwareDefinedPrint is a flexible Web to print solution which gives you (the printer) the opportunity to maximize your sales. Most printers nowadays, hinge on a specific group of customers who have increasingly become essential to satisfy. With SoftwareDefinedPrint Web to print solution, you get an enterprise grade Business-to-Business (B2B) private storefront engine which lets you create unlimited private B2B stores for your customers. What makes this unique is that each private store can have unlimited number of cost centres which can be configured with its unique categories, products, ordering rules, templates, approval workflow, payment rules, budget rules, and tax rules. Serving a large corporate customer base can be overwhelming, especially when there are lots of employees responsible for print procurement in different cost centres of the business. With SoftwareDefinedPrint, printers can configure budget control at a divisible manner, and each cost centre can be assigned a budget on daily, weekly, quarterly or yearly basis. SoftwareDefinedPrint approval workflow does not only let you define which cost centres and users require ordering approval, but it also allows you to determine which users can approve orders. If a user with limited permissions placed an order, those with approval capabilities are notified automatically via email to complete the process. 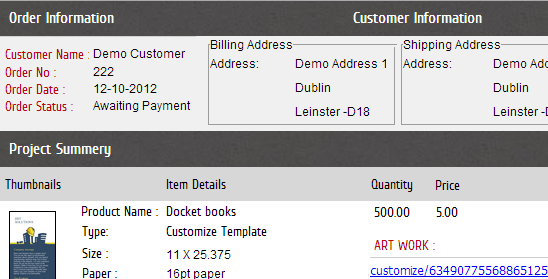 It doesn’t stop there; our Web to print solution also supports multiple order approval. Our interactive template editor enables your customers to easily and quickly customise, proof, and approve documents from a web browser directly. The Interactive Designer is more like a simple Photoshop application than an online form. Users can add new text areas, new images, move their position on the template, rotate them, adjust layering, change justification, crop images, and users can also be allowed to change font characteristics. On placing an order, you, as the printer, will receive a press-ready PDF file. Think of the time you’ll save and headaches you can avoid by having your customer complete these often tedious steps online. The Form Based Template Editor is commonly used to maintain brand integrity, create templates that customers can use to enter data and images, and view an instant proof with the data and images merged into the design. Templates can be for almost any type of print item such as business cards, signs, picture books, letterhead, labels, greeting cards, notepads, canvas prints, etc. The standard templates are “structured”. The user is simply entering data and or selecting images. Unlike the Interactive Template Editor, Text and image areas can’t be moved, rotated, or scaled by the user. Font face, font style, font size and font color can be locked or the user can be allowed to use Rich Text to change those attributes. Based on PDF open standard, our designer is easy to use. All you need to do is to load your PDF documents into web based administrative tool and then convert them to templates by simply defining how exactly you want the template work for your customers. SoftwareDefinedPrint supports a variety of font type including OpenType fonts, True Type, and Type 1 (postscript), while allowing you to choose the format in which the fonts are encoded e.g. latin or unicode format, to ensure compatibility with your equipment. You can also control if fonts are fully embedded, subsetted (partially embedded), or not embedded at all. A wide variety of image types and formats are supported within templates including .png, .jpg, tiff, and .pdf. In addition to this, we offer strong support for .psd .eps, and .ps. Images can be added to templates in a number of ways. For example, when configuring a template, you can designate an image field demanding your customer to upload a file. You can as well set the field to stretch or scale the image automatically to fit the pre-set area on the template. Along with this, a cropping tool in the web browser allows your customer to select the portion of the image to be used in the template. Instead of requiring the user to manually upload an image, your template can offer a selection of images for a particular region or area. Our designer studio supports this capability with image pickers –a drop-down menu of stock images pre-loaded for each template. The tool allows your clients to see a thumbnail of all available images from which they can choose one to insert into the template. Our designer studio also allows you to define logic to reformat, move, and suppress text as required. This is essential especially when creating templates that must conform to client’s design standards. With field logic, you can easily perform text reformatting, combine user entry such as multiple fields, and even delegate when text should be suppressed especially if any of your customers didn’t enter information for a field. For highly customisable results, a template can be merged with a database. SoftwareDefinedPrint Designer Studio supports this capability with variable data publishing. For truly personalised output, simply specify that a field must come from a database (say an excel file) supplied by the client when creating the templates. For some templates, your client may need the simplicity of having certain text and/or images entered based on a selection the customer makes from a drop-down menu. This workflow is ideally suited to customers who may be a franchise with many different locations. By simply choosing their locations from the list, their information such as address, state, city, zip codes, phone number and even logo associated with their chosen location will be entered for them automatically. Any time they select a different location, all the text and images will change accordingly. Your customer can still override any field as needed. – SoftwareDefinedPrint Web to print solution allows you to define the colour space (RGB, CMYK, or Spot Colour) to be used for all the text your customer adds to the template. – As well as generating previews using native colourspaces, SoftwareDefinedPrint Web to print powerful server side merging engine also uses an appropriate ICC colour profile to create a preview for your customer to see. QR codes offer a distinct way to bridge on– and off– line media, and are expected to grow exponentially in popularity over the next few years. At SoftwareDefinedPrint, we support a number great QR code types like Contact, phone, email, website, and the like. Forget FTP, email, thumb and CDs drives. Our in-built file upload system does not only allow for files submission such as image files, native Adobe formats, PDF, Quark, Microsoft Suite, and even archives, but it stores the files securely while automatically generating a screen preview. It doesn’t stop here, when new files are replaced, the old ones are kept in the order history. Majority of file errors and order delays occur as a result of common file mistakes like resolution and colour space. As well as automatically inspecting image files for integrity in real time, SoftwareDefinedPrint Web to print solution also keeps your customers apprised of any apparent issue before placing their orders. This does not only prevent customer frustration, but it also saves your employee’s valuable time. As we all know every business owner loves reorders! In print business, reorders are one of the best indications to know that your customers are loyal and happy with you as their print supplier. SoftwareDefinedPrint Web to print solution makes reorders as easy as rolling off a log for your customers. The control panel allows you to create additional users, templates, products, and categories, provide estimates, manage orders, check inventory, and so on. You are even able to assign different levels of permission to your employees to ensure the right people manage the right things. The intelligent shopping cart engine offered by SoftwareDefinedPrint keeps you abreast of unordered items in a customer’s shopping cart. The module is built to record/save unordered items for every customer. You can easily configure SoftwareDefinedPrint to send an automated notification to the end customer as a reminder about their unordered items. All of your orders can be managed from one screen. The navigation icons next to each order allow you to easily change status, print job tickets, view invoices, view customer comments, and so on. SoftwareDefinedPrint helps generate unique job ticket for each order placed by your customers. Practically, all available information is synopsised on this sheet for your reference. We understand that customers’ projects don’t usually fit in the standard catalogue product. Our custom quote engine does not only capture all customer requests, it also allows for easily quoting, building and paying for a custom project through the online store. As with the standard system, the workflow also preserves all the conveniences of file processing, communication, built in billing, and automated shipping. Tax structure is another huddle to cross for any online print supplier! SoftwareDefinedPrint offers you absolute control over how taxes are applied to your business regardless of what you sell and where you sell to. – Automatic sales tax calculation based on the delivery address. Online presence opens your business to many different online shoppers worldwide. Depending on your business and customers base location, you will need to set up the appropriate currency type for your business. SoftwareDefinedPrint web to print solution understands many languages when it comes to currency. With SoftwareDefinedPrint Web to print solution, you can accurately offer stock levels for static items that can be managed easily by both the printer and supplier. There are times you may need to send jobs to an outside print vendor for printing. With SoftwareDefinedPrint vendor module, you can generate an unlimited list of vendors to use, and even send specific product orders to them automatically. Sending a timely message to the right group of prospects is another thing which raises the bar in the creative industry. SoftwareDefinedPrint customer and prospect lists functionality enables you to easily collect email list subscriptions and generate customer lists. Another daily headache printer’s face is dealing with shipping software, tracking numbers and exceptions. SoftwareDefinedPrint offers flexible shipping options as an underlying element of its product catalogue. Live tracking information and direct shipment submission to FedEx, USPS, or UPS are all built-in and automated. Local customers are the life line of the majority of print businesses. SoftwareDefinedPrint Web to print solution offers you flexible, built-in free and paid local delivery options. Web traffic is key to your online success. SoftwareDefinedPrint offers you the essential tools you need to drive valuable traffics to your site, analyse visitor behaviour, and help you make informed business decisions. Each storefront at SoftwareDefinedPrint is built automatically on SEO best practices. This implies that all the content and products in your catalogue are easily seen and indexed by search engines. Keeping yourself up-to-date with the right information allows you to make informed and more effective decisions. SoftwareDefinedPrint Web to print solution offers a comprehensive Reports & Analytics suite. Our in-built CMS lets you personalise colours and banners with no trouble. If what you are after is a bespoke storefront, you can simply work in harness with one of our professional designers to create unique look for your storefront.